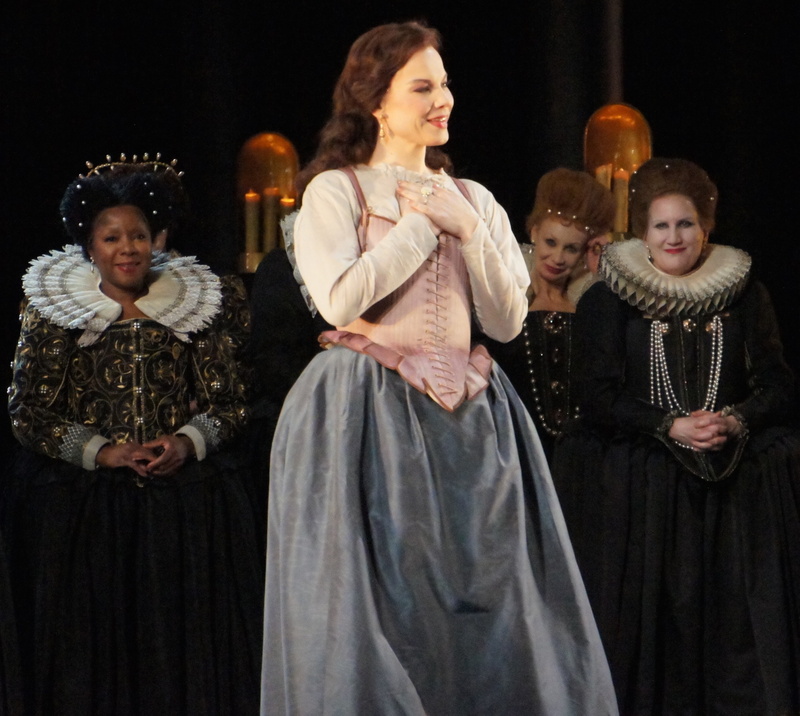 Met Opera’s stunning production for their premiere season of Roberto Devereux boasts four world-class singers in the leading roles. 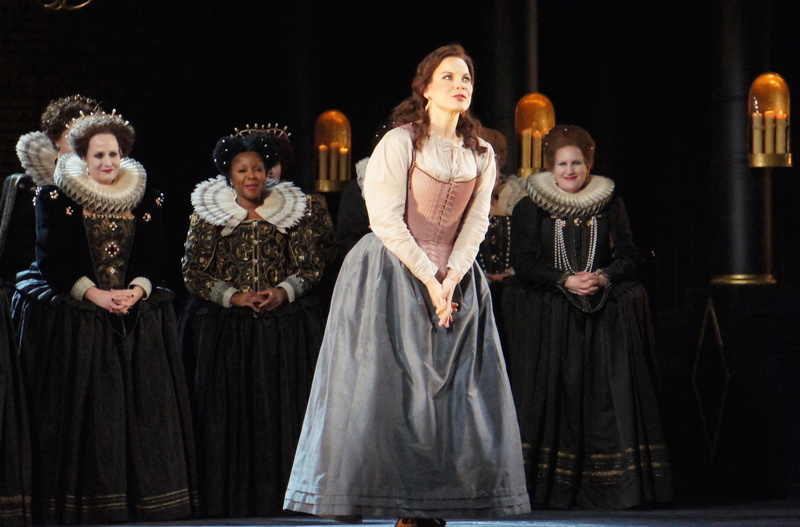 Opera cognoscenti will already be aware that this production completes acclaimed American soprano Sondra Radvanovsky’s goal to portray the three major Donizetti queens in one Met Opera season. An extraordinary vocalist and excellent actress, Radvanovsky triumphs in the wonderful showcase of a role that is Queen Elizabeth. Sir David McVicar’s name is a virtual guarantee of a sumptuous, intelligent production. 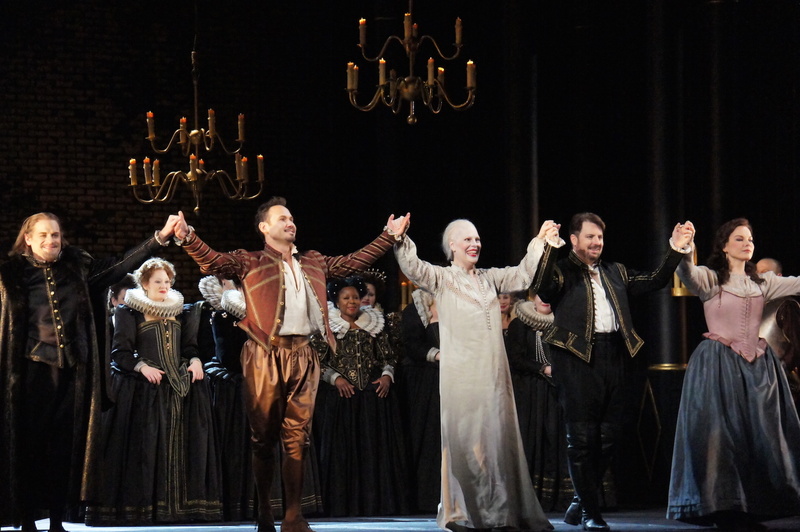 In this post-Zeffirelli period at the Met, the production values of Roberto Devereux provide a crowd-pleasing level of spectacle. Combined with the stellar cast, this is what coming to the Met is all about. Being director and set designer allows McVicar to realise an integrated concept for the staging. As with his epic Don Giovanni for Opera Australia, the opera takes place on one massive set, despite the mention of various locations in the libretto. The grand black and gold setting is visible as the audience enters, with an ominous sarcophagus centre stage. As mourners gather during the overture, the strains of “God Save the Queen” seem ironic when the Queen’s body appears to be on display before her funeral. The rear wall glides forward and the sarcophagus is swept away. 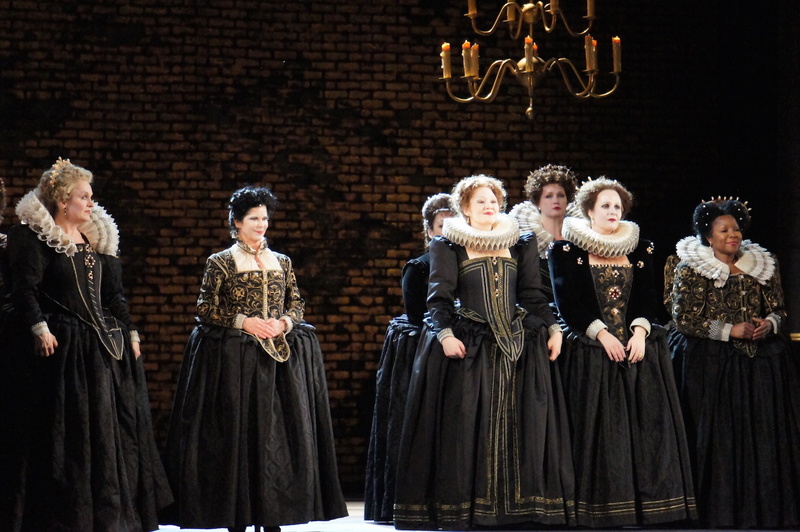 In an interesting move, McVicar has the ladies and gentleman of the court stay on side stage all night, watching and gossiping during even the most intimate of scenes. It would seem that royalty has always lived in the public eye. Entering in a delectable gown of muted emerald silk, mezzo-soprano Elīna Garanča, as Sarah, exhibits the quality of singing that will be a hallmark of the evening. The increasingly mature tone of her voice streaked with the sorrow of unrequited love, Garanča sings Sarah’s melancholic aria “All’afflitto è dolce il pianto” with lovely control. Costume Designer Moritz Junge delivers gowns that are as glossy as the setting, tweaking the period look with a few modern angles. Queen Elizabeth’s virginal character is represented in her pale, incredibly lavish gown when Radvanovsky first enters. The vocal fireworks commence immediately as Elizabeth furiously seeks the woman who has Robert’s attention from her, not knowing her friend Sarah is the offender. With the Queen in her late 60s, Radvanovsky gives her a slight hobbling limp and uses a smart red walking stick. The four characters interact in a series of duets (and one trio), with each combination equally enjoyable in this company. With two women in love with Robert, it is perhaps appropriate that tenor Matthew Polenzani looks particularly handsome, with light beard and sharp hair cut. Sparks fly in his act one duet with Radvanovsky, “Nascondi, frena i palpiti” as the Queen quarrels jealously with the object of her affection. 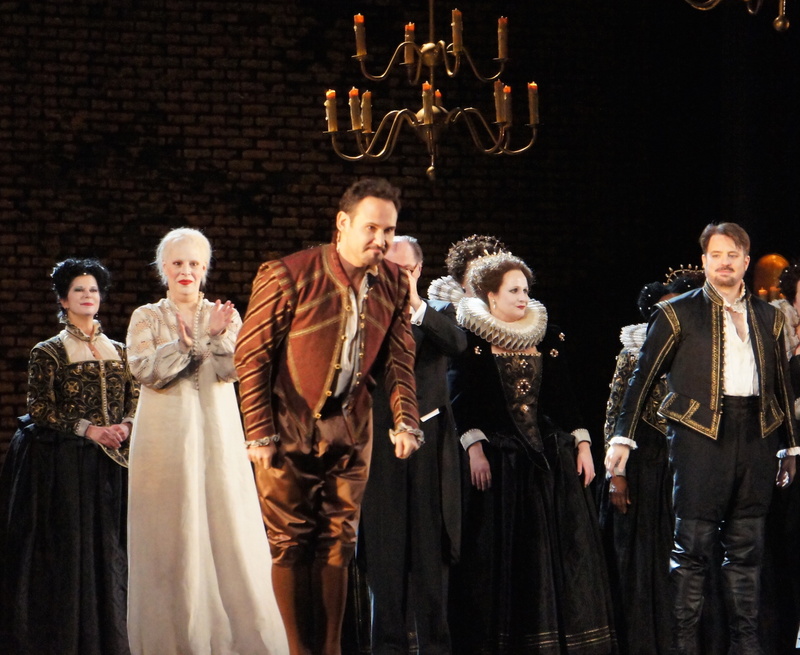 As Duke of Nottingham, baritone Marius Kwiecien completes the quartet of stellar lead singers. Following the arc of the wronged husband, Kwiecien demonstrates his strength and flexibility as an actor, singing with heroically optimistic tones in act one, before adopting a darker, vengeful feel in act three. Alone together, Robert and Sarah sing bittersweet duet “Dacchè tornasti, ahi misera,” with Polenzani and Garanča finishing exquisitely with heart-melting piano, a capella phrases. 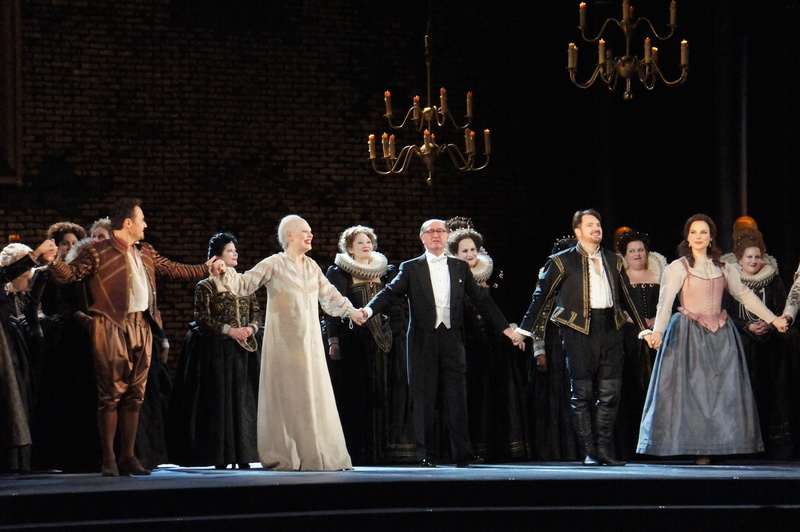 The heart of the drama occurs at the act two finale, as Elizabeth admonishes Robert for accepting a scarf from his lover, an object that the Duke recognises as coming from his wife Sarah. The trio builds to a peak as the chorus joins the final moments. Alone in his prison cell, Polenzani gives a stirring, carefully calibrated performance of Robert’s big aria “Come uno spirto angelico,” which is met with great acclaim from the audience. Unfortunately, at this performance, Polenzani’s voice tires somewhat at the end of the subsequent short aria, “Bagnato il sen di lagrime,” producing some strained notes. It remains a wonderful performance overall. The spotlight returns to Radvanovsky for the final scene. In her madness, the Queen removes her robe and wig, looking like a ghastly shadow of her former glory. 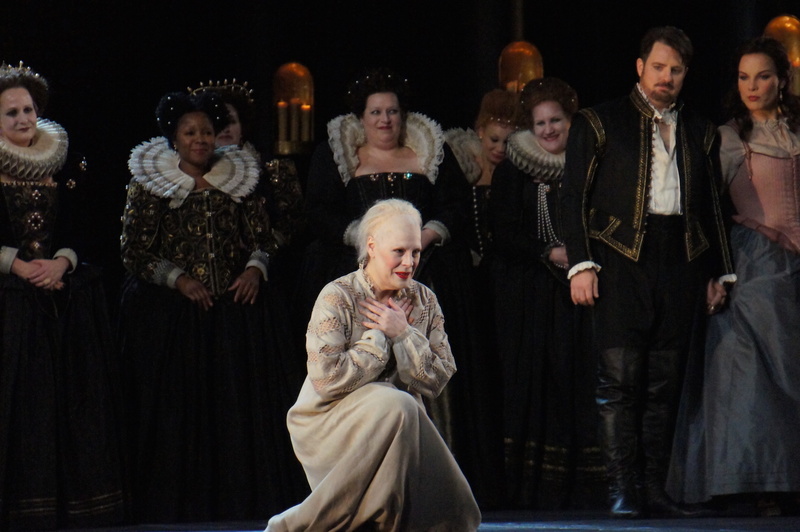 Radvanovsky’s commitment remains strongly focused until the last, the Queen’s delirium providing a final showcase for the untiring suppleness of her voice. Maestro Maurizio Benini demonstrates his special flair with the bel canto repertoire, presiding over a seamless performance of Donizetti’s thoroughly enjoyable score. 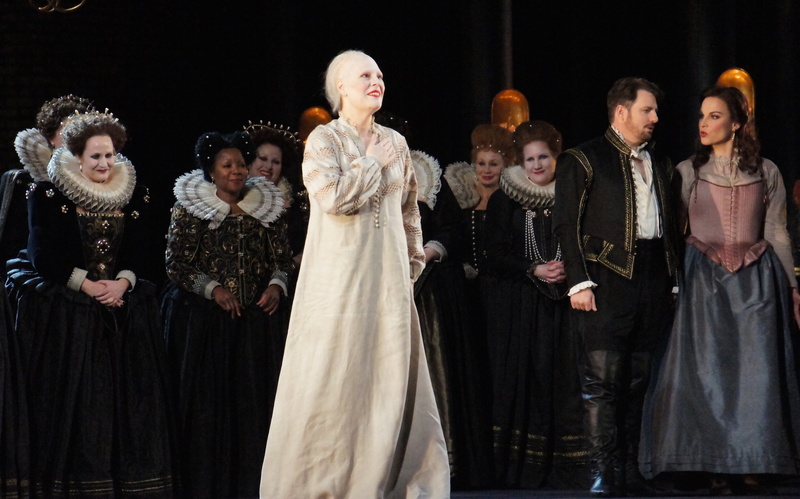 Roberto Devereux is a highpoint at this point of the Met’s 2015-2016 season. Attendees will see every dollar of their ticket price on stage. 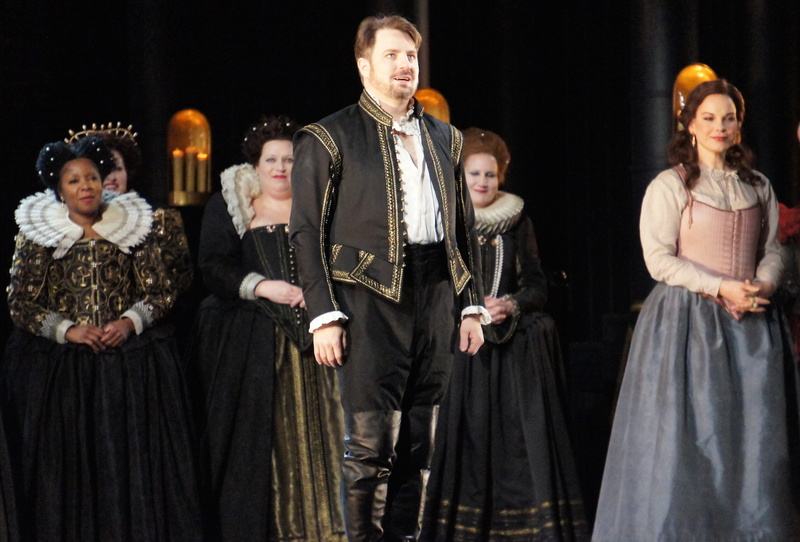 Roberto Devereux was reviewed 7.30pm Monday 28 March 2016 at Met Opera, NY.